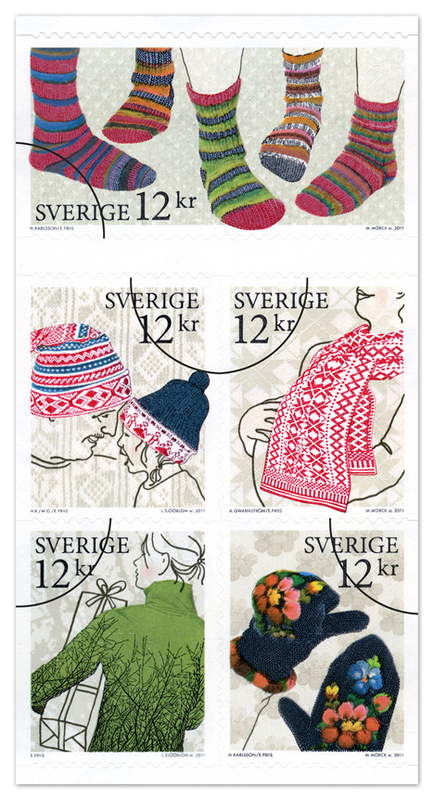 Here is a selection from what the National Postal Service in Sweden has released this year. Philately and stamp collecting is a vast field, so we just wanted to show this collection from the perspective of the design core. That´s the point of view. The craft of a stamp regarding the cultural values, which motifs are selected for such occasion, what leads to such selection and how a designer or illustrator face a project like this framed in such small canvas. Below we selected several important elements that make the collection and every designer gives his opinion about it. When it comes to renewable energy. Sweden is at the head of the pack, relying on renewable energy sources for more than its energy needs. The country invested in water power early and even a lot of bio fuel, primarily from the forest, is used today. A few local mills from small towns in Sweden are steeped in tradition. Mills are a unique and fascinating part of the country. These stamps were depicted in a booklet with self adhesive stamps for international letters. The stamp enhances a greeting from these towns. 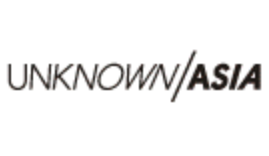 “It’s been inspiring and challenging to work with the Industrial Environment issue. I was given a chance to delve deeper in these communities, an important part of the history of Sweden. 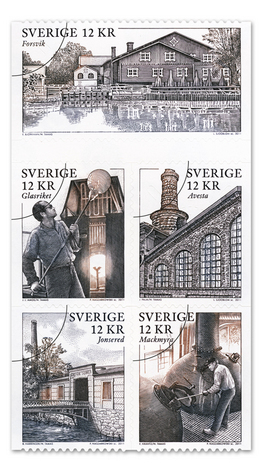 To capture in five stamps both the spirit of the times and the breadth of industrial environments from north to south. The selection of the towns is based on industrial environments that preserved their cultural heritage. United Nations has named 2011 International Tear of the Forest. Activities will be held throughout the entire world to celebrate the forest and its value and promote sustainable forestry. Kajsa Eldsten is an illustrator. 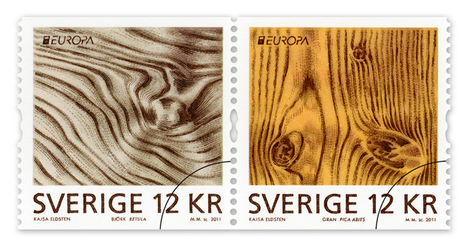 She decided to use the grain of the tree as a pattern to design the stamp. Birch and spruce in the spotlight. “Working with stamps was very different that working with editorial illustrations. 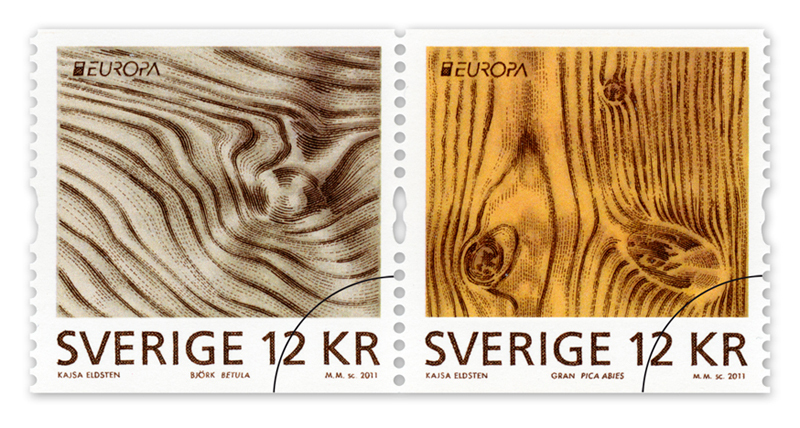 It was important to occasionally view the stamp motif in its actual size to understand how the final result would look. 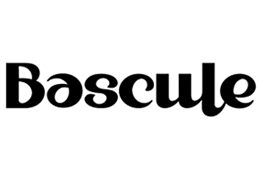 Simplifying and scaling down the details was a very important part of the process,”* admits Kajsa. 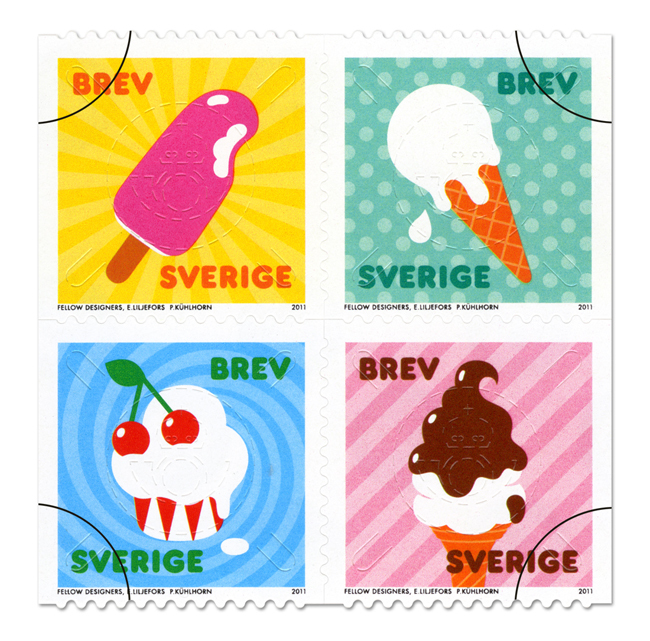 During the summer it was possible to find a booklet with scrumptious ice-cream illustrations. A perfect theme when in vacation. 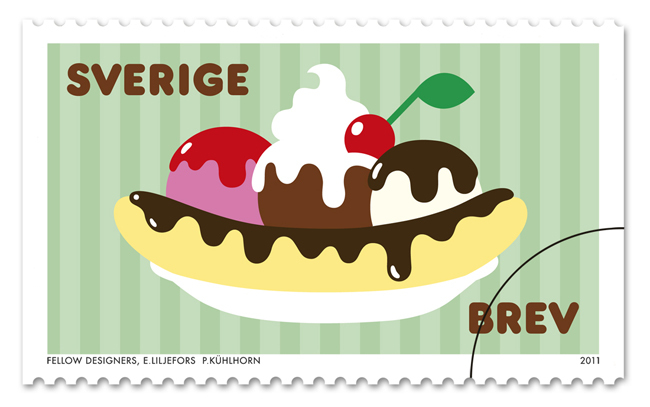 The stamps are issued in a booklet of ten self-adhesive stamps with four motives as well as in a coil with a banana split motif. These beautiful pieces correspond to Fellow Designers a Stockholm-based graphic design and illustration studio established in 1997 by Eva Liljfors and Paul Külhorn. In fact, one of the stamps whose design has been done by the studio, it is called to be one of the designs of the year; attractive candidate to the `Stamp of the Year´ award. It is based on an illustration of a banana split. Nevertheless nothing is confirmed yet. “It was incredibly fun! Stamps have always been a part of our frame of reference. We have always said that we wanted to work with stamps, currency notes and the Advent calendar at some point in our lives. What is funny about the format is that we do a lot of work on posters and we usually say that a poster is never larger than a stamp in its environment. Often a poster is seen from a distance and in relationship with everything else it is, well, very small,”* the duo assure. Knitting is traditionally a woman’s pastime, a quiet skill that has passed from one generation of a family to the next. Many patterns and styles of hats, scarves, sweaters and gloves can be traced back hundreds of years to specific areas of the country. The stamps depict both traditional and modern knitting from different regions in Sweden. The stamp designer for this booklet is else Friis. “The motifs are designed as tiny stages where a small piece history is explained in every picture. I created the proofs using a mixture of techniques ≠ photo, computers and hand-drawn sketches in ink,” she says. The 2011 year set is conveyed in this selection. Nevertheless we wanted to know a bit further. 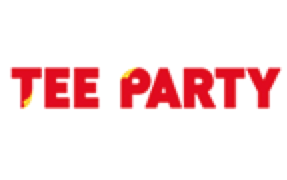 We had the chance to speak with Mr. Thotsten Sandberg, responsible at the National Post Service in Sweden, enough to drop a few questions in order to know a bit more. How frequent a new booklet is out? Five days of issue every year: January, March, May, August and November. 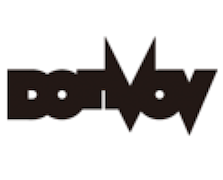 How does the design selection work? The Stamp Advisory Committee, chairman the CEO of PostNord (Sweden Post + Denmark Post) decides the themes, then the Design Committee, chairman the CEO of Sweden Post Stamps, decides the artist and motifs. 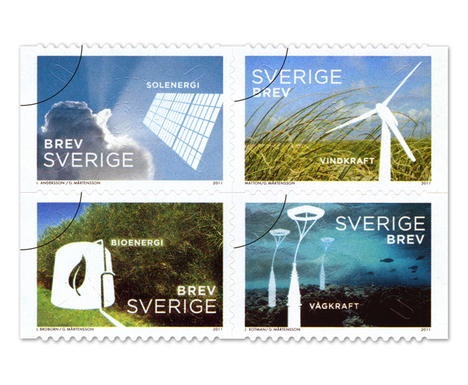 The designers are employed by Sweden Post Stamps, and free artists and graphic designers. Anyone could apply to design a booklet for the Post Service? Is there a theme on every season? We have season themes, always for summer stamps and now and then for autumn stamps. How a series of stamps is created to commemorate a particular event in our society? We receive a lot of suggestions, the Stamp Advisory Committee decides, from a point of view to create a well mixed stamp programme for every year. Do exist many purchases from abroad of Sweden? Yes, we have a lot of customers in other countries. Any particular design acclaimed by collectors during this year? 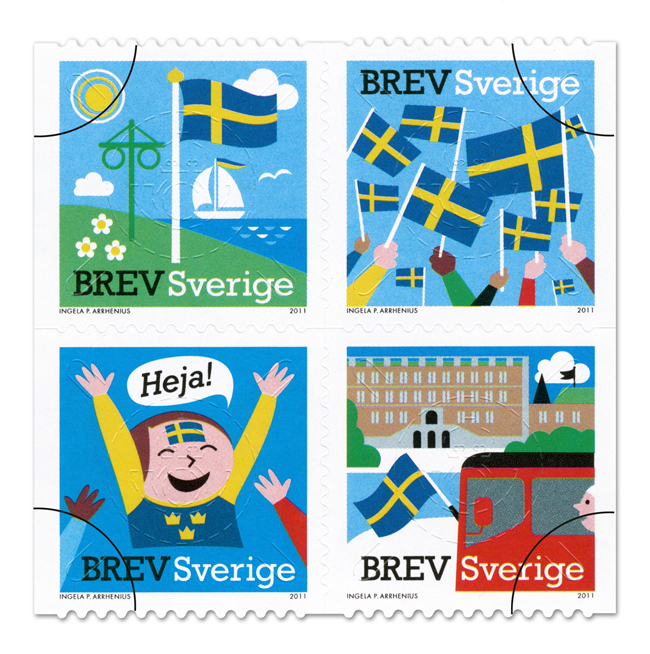 We arrange annually a voting “Stamp of the Year” *. 2010 the winner was a stamp depicting a cat. Is it any place in Stockholm where to see an exhibition with the collection? Yes, the National Postal Museum, situated in Gamla Stan, the Old Town.